Thread: Can I repair surge protector? Surge protectors have a life cycle and changing it with a new one every 1 or 2 years is recommended, you know. I dissassembled my cheap surge protector and looked inside. It is the same power strip with 350 Joules capacity, MOV and auto fuse. So, can i repair/ renew it by replacing the MOV? Also, can i increase joule capacity by replacing with a better MOV? It is working now but I have a worry about joule capacity. I'm using it for 1 year. 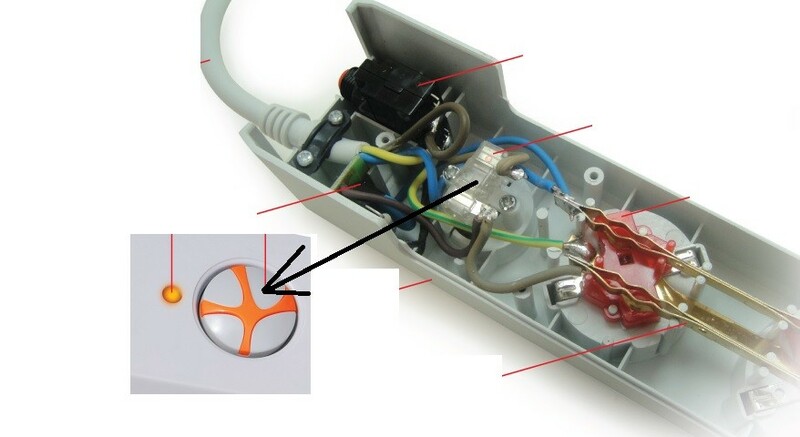 Another thing I would suggest is buying a surge protector that has a "protected/not protected" LED so you actually know if the strip is working properly or not without having to open it up and replacing the MOV. Mine has a LED but I don't know if it shows protection status or electrical connection status. It should say in the manual or on the box. You can delete this post! Last edited by Overclocked; 11-29-2017 at 06:11 PM. I showed the I/O switch with an arrow. The led is right in front of it. I don't think a surge protector in a plastic case is very safe, might want to go for one in a metal case. Yeah. That's just a power LED. Nothing special. One can hope that it's UL 94V rated plastic and not something that will burst into flames. I have over 20 Tripp-Lite isobar ultras around the house, replacing them could set me back around $1,000; not going to happen. They can handle over 3,000 J each and include a circuit that tells me if the protection is still good. Not one has lost protection yet, although a few needed the circuit breaker replaced, and most needed a new switch as the neon light had burned out (I have been buying them second hand as the years go by). They are built like tanks, and I expect them to outlast me; I use them on the washing machine, garage opener, furnace as well as the computers, and suspect they are part of the reason some of my stuff is still working after 20 years. Beyond MOVs they have filters to block surges. Last edited by ashiekh; 12-28-2017 at 10:52 AM. Maybe not. You can see the circuit scheme on this link. Just how effective can a surge protector be?